According to the National Institute on Drug Abuse, the use of tobacco is the leading preventable cause of death in the US. Many people smoke, yet plenty of them don’t want to be smokers. Why? Nicotine is highly addictive. Because of this, smoking can be a very difficult habit to kick. You can have all the will power in the world, but if your body literally craves a substance, it can be impossible to ignore. Studies have shown that cannabis has actually been found to help curb the cravings for cigarettes. Now for most people, getting high from traditional flower or THC oil is not an option throughout the day. However, CBD oil, which is the non-psychoactive ingredient in cannabis extract, has shown great signs of reducing smoking rates by up to 40% in people that are active smokers. CBD is quickly gaining acceptance among the general population as somewhat of a cure-all for ailments such as chronic pain, insomnia, depression, seizures, an the like however, scientists and researchers are still actively exploring its benefits and proper usage towards smoking cessation. The overall conclusion is that there still needs to be more research conducted into whether or not cannabis can be used on a mainstream level to help users quit smoking. Secondly, which type of consumption would be best for users, as there are now various methods such as vaping, oral ingestion, topical, etc. 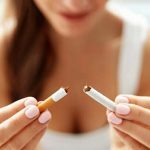 Since we are still in early stages of testing and research, using CBD to quit smoking is merely a step in the right direction, as the addictive properties in cigarettes can carry many cues. According to a UK study that tested cannabis based products on active smokers, the next step is the increase CBD dosage to view how smoking cues and cravings react to higher potencies. Given the vast number of people that have repeatedly tried to quit smoking, CBD just might be the solution they've been searching for ... stay tuned! PreviousPrevious post:A beginners guide to proper CBD dosage.